When was the last time you stared into nowhere, or better yet at something out in nature? I mean like really lost yourself in the moment with no dings or tings or rings perpetuating your space or thinking? I find it harder and harder to acquire moments like these. Recently I did a little experiment where I turned off all notifications on my phone. So no matter what form of communication trying to contact/lure/disrupt was not available to my anticipating ear. I found I had more peace in that day and probably lower blood pressure. It’s not to say I don’t welcome contact with friends or family. But all this technology and availability 24/7 can be exhausting and stressful. Couple that with the daily grind and you find yourself longing to stare out into the abyss. Especially when the weather is nice I like to gaze at the tops of trees dancing in the wind or under the glow of the moon. This is something I discovered by accident a few years ago. Sometimes days or even weeks go by when I don’t do this, however. Work and domestic duties and the pulsing of time does not lend itself to such leisure provocation. Then perhaps during a buzzing moment I catch a glimpse of a bluebird or heron or hawk and I’m reminded to stop and just watch and BE. There is something so peaceful and organic about engaging in something so simple. We tend to look down at our racing feet or ahead at our constant to-dos. Children are always looking up and noticing things we don’t, like a wasp’s nest or a pink airplane or a woodpecker in a tree. We should strive to grab some of that youthful curiosity. Maybe those old ladies who sit on park benches and feed birds have it right, too. Maybe they are laughing at us, thinking we’re out of our minds. 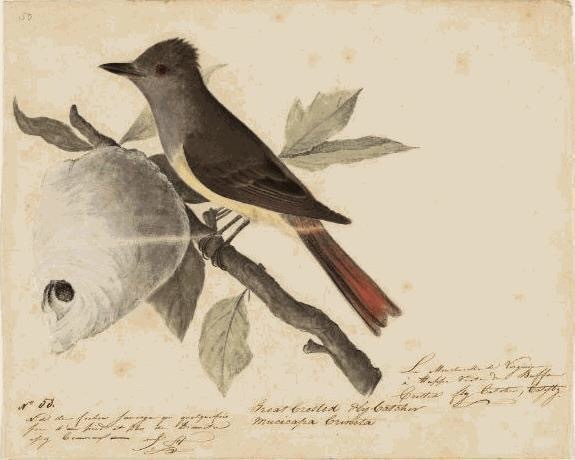 Drawing by John James Audubon, who started a revolution of bird watchers. The old ladies have it right indeed. This is a beautiful reminder. Thank you, Jude. Yes it’s crucial to make time for these simple things.